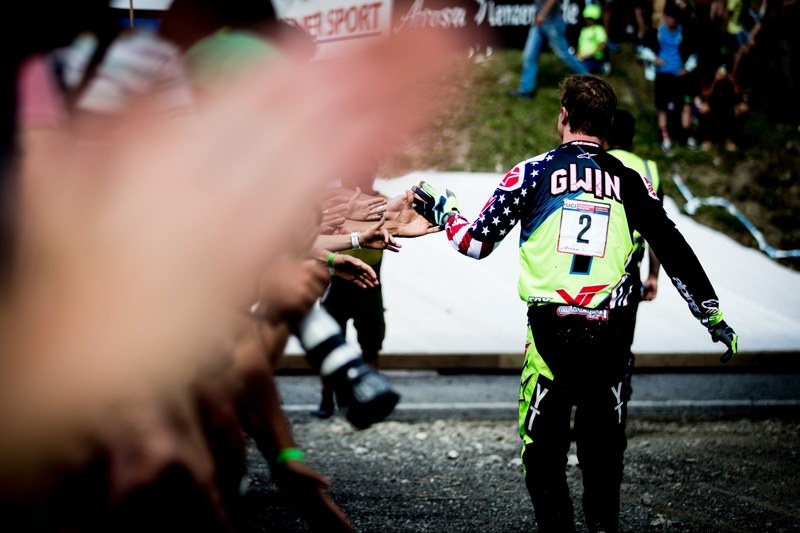 Last year in Lenzerheide Aaron Gwin came within 96/1000ths of a second of winning his first World Cup on Swiss soil, and was highly motivated to take the victory this weekend at Round 5 of the World Cup series. A last minute crash on Thursday saw Aaron in the doctor�s surgery requiring 4 stitches to his right knee yet despite this injury, he went on to win the qualifying race and set the tone for the weekend. Mr Gwin meant business. On finals day, as the last man down, Aaron turned the interval clocks green from the outset, up at sector 1 and 2, and then impressively up by 1.5secs at sector four before a puncture brought his run to an end. The disbelief was clear on the faces of so many people in the finish arena as they had just watched an incredibly fast run turn into an incredibly disappointing finish to an impressive week. The poise shown by Aaron in the face of this almost unjust end to his run was extremely professional, and he was quick to congratulate those that would take to the podium, including series leader Greg Minnaar. Oh man, well, we battled through a tough weekend and got into the finals with a solid shot at the win. Unfortunately I cut a hole in the sidewall of my tire about � of the way down the track. The tire was going flat quick but I pushed it as long as I could. I broke the rim soon after and then everything came apart a few turns later. That�s racin�, sometimes things don�t turn out as you�d hoped, but at the end of the day if you�re content with the effort that you put in, it�s still a positive. The crowds today were massive and it was so cool meeting so many people who appreciate what we do. 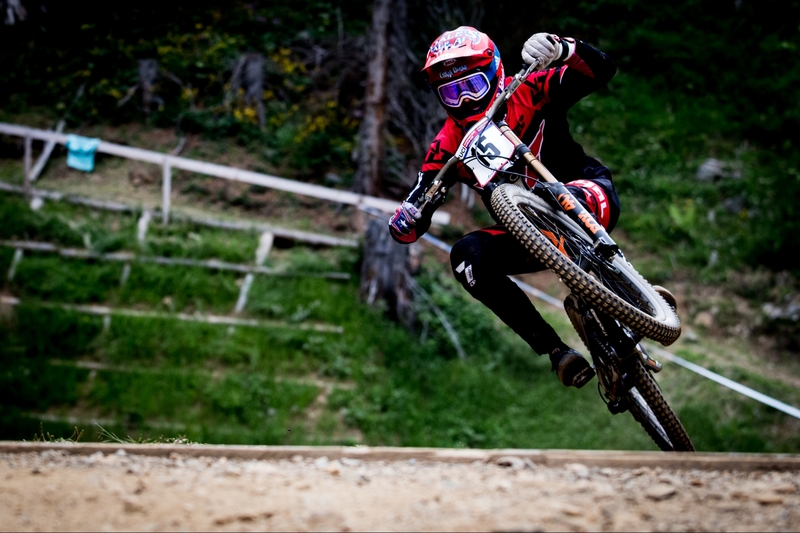 Good times were had, and I wish we didn�t have to wait nearly a month until the next World Cup, can�t wait!! Teammate Neko Mulally came out on the wrong side of the rule book when he was refused a start after failing to wear the appropriate back protection which is required in Switzerland. Cleary this is a very big disappointment not only for me, but everyone on the team and those that support us. I chose to change what I had for back protection and even though the rules are not consistent across all World Cups, I accept that what I did was not correct and I apologize for the mistake. This has cost me my top 20 protection status, but I will do all I can in one month to regain a top 20 ranking as my wrist should be fully recovered for Round 6 at Mount-Sainte-Anne. Nothing really describes the range of emotions you go through seeing your lead rider on the ride of his life, challenging the best in the world for the overall series and taking nearly 2 seconds out of them on a track that is known as one of tight margins, then to see it all come apart with one sector to go. There were no words. Aaron handled the moment with great maturity and soon had all the team on a positive note despite the clear disappointment we�d all felt for him. Neko made a mistake today and has paid for it. The issue is not with the UCI as I have read everywhere. 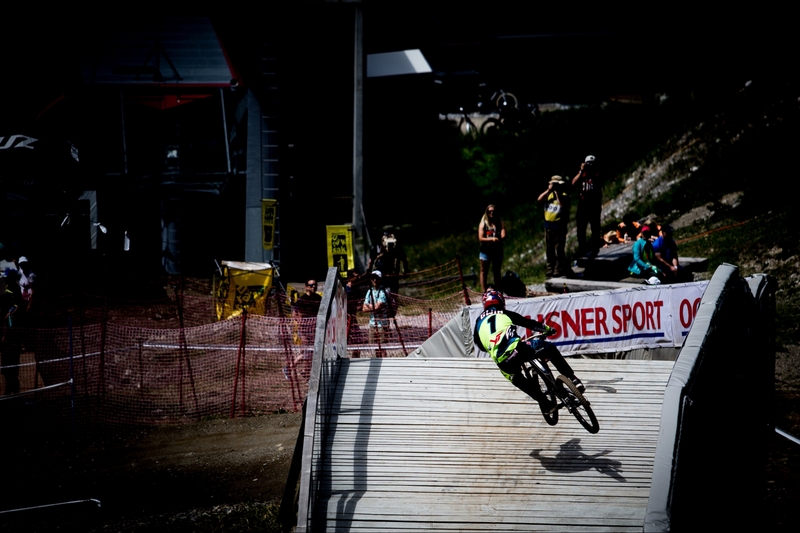 All DH races held in Switzerland are governed by Swiss law, and the World Cup must comply. It�s the same in France, and all riders and teams know this, and are warned on several occasions that protection made of hard plastic must be worn. Neko didn�t follow that rule and didn�t advise anyone on the team of his intentions, and was caught by the official at the top. Neko has apologized to everyone on the team and we move on. Both Aaron and Neko are heading to the US National Championships being held in Snowshoe West Virginia on July 20 to 23, and the team will be bringing its big rig to the event. We welcome all YT Mobsters to come and visit us later this month as the guys race for the right to wear the US flag on their left sleeve for the next year.